The title, the cover, the very concept of The Martian gives the illusion that its pages will be peopled with green aliens, intergalactic war, and other typical science-fiction paraphernalia. Andy Weir, though, writes The Martian not as some wild and fancifully romantic sci-fi novel, but as an engineer would write a book: entirely precise, absolutely plausible, and with zero fluff tolerated. 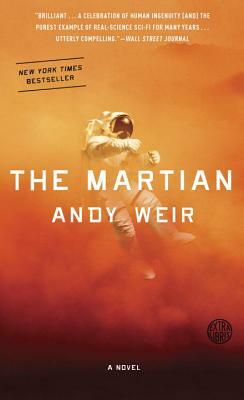 And so it is that Weir sets the stage for his main character Mark Watney’s abandonment on Mars. The novel begins in the aftermath of a freak accident that both nearly kills astronaut Watney, and proves to save his life. Watney comes to consciousness, and reflecting on his situation opens the book with the infamous first words: “I’m pretty much fucked.” Now it’s up to Watney to survive what would appear to be a death sentence with only his engineering and botany skills to help. As the novel progresses though, we see that it is also his positivity and perseverance that pull him along. These attributes, coupled with his very base human urges and desires, are what make Watney a character you find yourself rooting for more and more. Watney is not the only character whose mind we are granted access to though. NASA Mission Director Venkat Kapoor, satellite engineer Mindy Park, and even members of Watney’s crew make their way into the novel to break up the journal entries that lead us into Watney’s character. Watney’s account, most especially, tends to be pretty dense with technical content allowing for people like me (non-engineering minded readers) to occasionally gloss the text, glass over, or lose a visual of what’s going on. As a technical writer and editor, I’m familiar with reading just this kind of content, and I am equally familiar with employing all of the above techniques to get through it. However, for the average person who hasn’t taken a chemistry class in 10 plus years, Watney’s technicality and specificity can be a bit burdensome. For those like my scientifically minded engineering colleagues, the book is not only a breeze, but an accomplishment among a genre often riddled with improbabilities and unrealistic scenarios. One of the most engaging aspects about The Martian, is Weir’s deep knowledge and wild imagination that he in turn imparts upon Watney and the book’s other characters. Whether you understand every concept or action, the book refuses to tip to the side of boring or burdensome as it might threaten to for some readers. It might help that the characters are so endearing and engaging despite their, at times, despicable demeanors. Though raw and unkempt, Weir’s characters are all too human and thereby more relatable than the sometimes contrived characters of genre fiction novels. Weir isn’t trying to do anything with these characters except to make them who they are, and he does a superb job of compelling readers to find sympathy for and relate to even the most obnoxious of characters. Most importantly, Weir’s cast speaks directly to the themes and intentions underlying his book. As he notes in the afterword, Weir’s goal is to show that humanity is not doomed to complacency or selfishness. When Watney gets trapped on Mars, every person at NASA, in China, and on earth is not only rooting for him, but pooling their collective resources to get him home. Weir invokes a sense of comradery among the human race, which (whether it is true of the humanity outside of his novel or not) invokes the ideal that humans have “a fundamental desire to help one another.” Though Weir may arguably be romanticizing this theme to a certain degree, it is definitely a quality that we busy, bustling, self-absorbed humans could use a reminder about once in a while. The perfect marriage of technical and narrative writing, The Martian makes a perfect read for say a book club where you have engineers and book nerds in one place. Though recently acquired by Broadway Books and Crown Publishing, divisions of Random House LLC, Weir is the poster child for self-publishing success. Originally released as an e-book in 2011 and sold for 99 cents, Weir’s novel was not only picked up by a major publisher, but a movie is already in the works. Staring Matt Damon, Jeff Daniels, and Chiwetel Ejiofor, the film is slated for release in September 2015. Even though Weir assisted in writing the screenplay, read The Martian before you see the film so that you can experience Weir’s unique writing style, enrapturing characters, and insanely plausible scenarios just as they are meant to be experienced. If this book review peaked your interest, pick up a copy of The Martian at your local book store. Read more science fiction book reviews at Centered on Books.